Home / videos / Xiaomi Mi A1 MDG2 FRP/Google Account Bypass/Remove/Skip Oreo V8.1.0 Without Pc. Xiaomi Mi A1 MDG2Google Account /FRP Lock Required File. 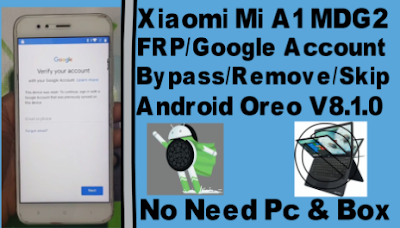 Xiaomi Mi A1 MDG2 Google Account /FRP Lock Method. 3# Go to talkback setting. 4# Go to Help and Feedback. 6# Play video and click share tab. 7# Now open google crome browser. 9# Download Quickshortcut maker and 2018 frp remove apk. 10# Open Quick shortcut maker apk. 11# Now disable find my phone,google play servic and google. 12# Install 2018 frp remove apk. 14# Rebot your phone and add new gmail. 15# About phone 4 time click buld namber. 16# Developer option open and enable oem unlock. 17#Unstall 2018 frp remove apk file. 18# 10min reset process then open your phone on normal mode.